Capturing your newborn in his or her first days is such a wonderful gift for your future self. A newborn photo shoot provides you the opportunity to go back and really appreciate your baby’s sweet face, little fingers and tiny toes as often as you like as far into the future as you’d like. The first week with your baby is a rush of adrenaline and excitement and you can’t imagine how quickly he or she will grow and change. If it’s your first baby, it can be a little overwhelming as you adjust to the newness of being a parent for the first time. If it’s your second or third (or more!) baby, you are not only managing the many feedings, diapers and sleepless nights, but you’re also chasing your older children and making sure they are fully included and comfortable in welcoming the new family member to your lives. Whatever your situation, it can be difficult to fully appreciate and remember the beauty and serenity of your newborn baby with so much going on around you. 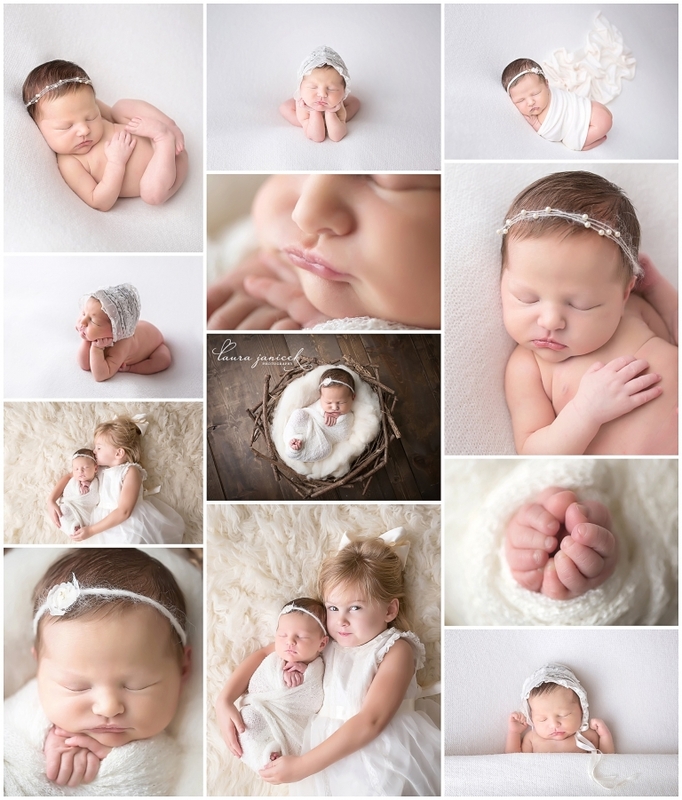 I offer a couple of options when it comes to photographing your newborn in those early days. For a fairly quick and simple baby-only session, I offer my Simply Baby session. This session is for baby only and lasts about an hour. It includes a handful of uncomplicated poses that are just enough to appreciate and remember those sweet newborn days in the years to come. If you have older children to include in the session, I offer my Luxe Baby session. This session allows for more time in the studio to include all of the Simply and Classic baby poses as well as set-ups to include siblings and/or grandparents and a few more complicated set ups. This is the longest session as older siblings can be very unpredictable as they welcome a new baby into their lives. 😉 We definitely don’t want to rush toddlers into anything when we want them to feel relaxed and give us their genuine smiles. I would love to help you photograph your new baby! If you’d like more information about any of my sessions, I am happy to help!